Heritage Safari Lodge is the perfect location for conferencing, family vacations and a travellers adventures. Heritage Safari Lodge was originally built in the 1940s at a famous watering hole along the Lourenco Marques (Maputo) route. Since then, the building has been restored to its former colonial grandeur, enhanced with new accommodation facilities as a KwaZulu-Natal, themed to highlight Zululand's own cultural development. Games drives, river boat cruises and clay pigeon shooting at this KwaZulu-Natal lodge can be arranged on request but is subject to availability. Tours to the nearby game reserves can also be arranged. Attractions in the area include the greater St. Lucia Estuary, Hluhluwe, Umfolozi and Mkuzi Game Reserves, Sodwana Bay and various Zulu cultural villages. There is an outdoor boma, 2 bars and social lounges, curio shop, the pool is in a garden setting, lapa, helipad, reception boma and an 80 seater air-conditioned conference room at this KwaZulu-Natal lodge. The al fresco dining area, resident library, TV and lounge with videos and games provide indoor enjoyment at this KwaZulu-Natal lodge. 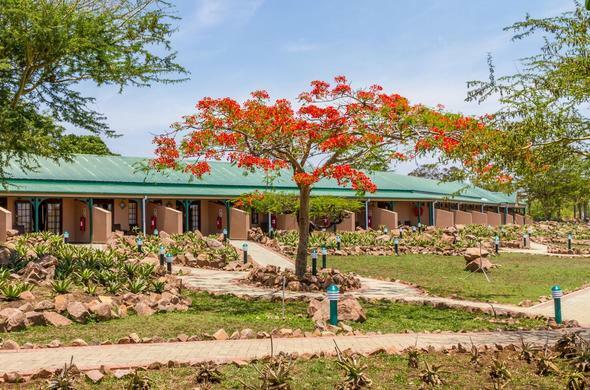 Child minding can be arranged on request at this KwaZulu-Natal lodge. Children under 18 are not permitted to participate in clay pigeon shooting. Walks in the bush may be dangerous and it's not recommended that children under 16 participate in certain walking activities. Bush activities for children can be arranged with your ranger.